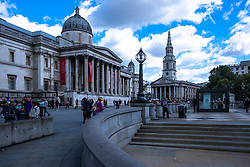 Trafalgar Square is a public square in the City of Westminster, Central London. 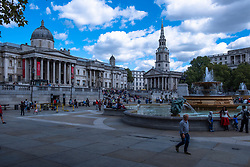 The site of Trafalgar Square had been a significant landmark since the 13th century and originally contained the King's Mews. 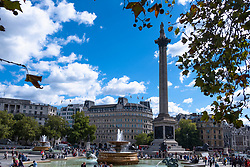 After George IV moved the mews to Buckingham Palace, the area was redeveloped by John Nash, but progress was slow after his death, and the square did not open until 1844. 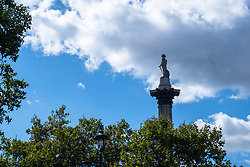 The 169-foot (52 m) Nelson's Column at its centre is guarded by four lion statues. 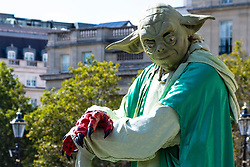 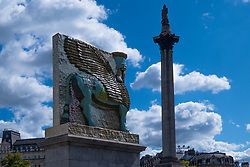 A number of commemorative statues and sculptures occupy the square, but the Fourth Plinth, left empty since 1840, has been host to contemporary art since 1999.